JoeMoving week is over now, and we made it successfully to our new place, which we like very much.That's the short version.The longer version will be told in three parts, and begins last weekend, as we packed up our apartment in earnest. Flashbacks aside, it really was not a traumatic packing experience, easy enough that we actually felt justified in taking evenings off and relaxing a bit. Maybe there's something to be said for this whole not having a ridiculous amount of stuff thing.Even with our limited quantity of belongings, as we cleaned out the apartment we did manage to generate a fair amount of trash and recycling. At Flogsta Låghus, as at pretty much every apartment complex in Uppsala, both of these are handled in tiny buildings next to each apartment block, and on days around the end of the month when there's a lot of coming and going these rooms are occasionally filled with interesting stuff. 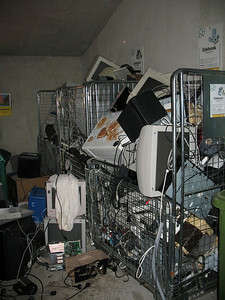 As I was making a recycling run on Sunday I was reminded of this fact (the wide-screen television sitting outside the trash room was a hint), and so as a break we decided to take a tour of some of the recycle rooms to see if there was anything we desperately needed. The first two were disappointing, but the third was interesting. Unlike the other little buildings, the third one we visited had three rooms: one standard trash and recycling room, one room filled with old electronics, and a third full of furniture! I say full, but the truth was that on this particular weekend, with what seemed like every other apartment emptying out, the contents of the furniture room had spilled out onto the sidewalk. 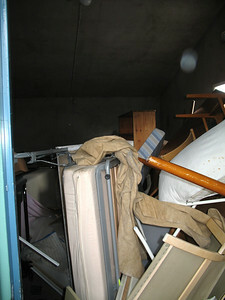 A lot of the furniture was in a bad way, but some of it was in good condition. When we first showed up there was a large pine dining table complete with four matching chairs, which would have fetched a not insignificant sum at any of the local second-hand shops—alas, no picture, as it had already been snagged by the time I returned with a camera. In fact, while we had the place mostly to ourselves when we first wandered by, this turned out to be an aberration, and on every subsequent visit the place was (literally) crawling with foreign students looking to score some free furnishings. Having just extolled the virtues of a limited possession existence, I have no doubt that you can guess what's coming next: we found some more stuff. Before everyone goes getting all worked up about it, allow me to assure you that we limited ourselves to a small handful of items, if not diamonds in the rough then at least shiny pebbles in the sand. There was a version of the Ikea chair I've been contemplating for a couple of months, a nice basket for corralling newspapers awaiting recycling, and a stainless steel colander. There was also a bright red end table I had under consideration, but when I returned for a second look it had vanished underneath a pile of broken furniture, as a clutch of exchange students had showed up and started to dig their way back to formerly inaccessible regions of the furniture room, turning up a couple of decent beds and a bookcase but utterly demolishing the room in the process. The next morning I headed over to see if the little table had resurfaced, and on the way out the door I grabbed the two spent light bulbs I'd been saving for the last couple of months as I'd noticed the night before that this new place had a recycle bin for them (I knew it had to be around somewhere). It turned out to be a good thing I grabbed them. When I got there, there was a man in a jumpsuit with a front end loader full of cardboard scowling at the building. After watching me recycle my two little light bulbs, he expressed his surprise that I had walked so far for such a small amount of recycling. It turns out that this guy's job is to go around all the various recycling rooms every day, gather all the stuff that's been just randomly dumped, and re-sort it to its proper destination. "Most of these kids won't walk two meters to put something where it goes," he explained, pointing out all of the cardboard that had, in fact, been dumped in the wrong room, just around the corner from its intended destination. He professed to be so moved by my random act of recycling (and, no doubt, so little eager to return to his pile of soggy cardboard) that he proceeded to give me a 15 minute lesson on where and when to find the best stuff. His haul over the last few weeks included a dozen 500GB hard drives, a 10 megapixel camera, a 10 m long tunnel tent (which his children, 10 years, 2.5 years, and 9 months, absolutely love), and an 80GB iPod! I agreed that it was amazing what people will throw away, while inwardly my pride at having found one Ikea chair started to seem somewhat unwarranted. In desperation to balance the scales, I dug through the electronics room until I came up with a nice halogen desk lamp, took one last look at the furniture (most of which was now utterly destroyed, having spent the night on the sidewalk in the poring rain), and then skulked away home with my tail between my legs.There was an interesting coda to this whole experience. At fika on Monday, Jennifer was talking about our packing up and mentioned that we had found this room full of discarded stuff free for the taking. Two of her co-workers immediately responded, "Yes, but it's illegal to take that." 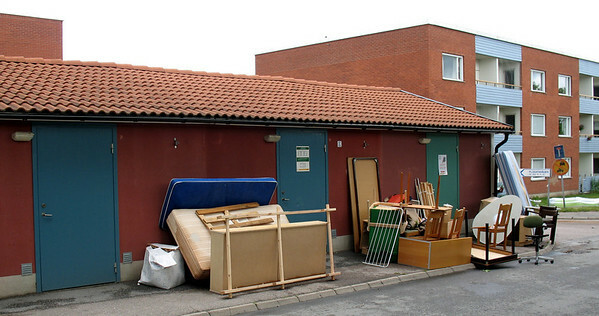 Jennifer explained that it was all obviously intended to be recycled, but they insisted that because of the wording of some Swedish law meant to protect the privacy of your trash, it was illegal to take anything that someone else had discarded. When she argued that there had been plenty of other people going through the recycling at the same time, they asked, "Swedish people?" to which she had to admit that, no, it had been all foreign students. At this her co-workers nodded, as if this had only proven their point.They probably should have told this to the two middle-aged Swedish women I ran into Monday morning, who were carefully picking through all of the recycling and taking every salvageable piece of kitchenware. I tell you, the criminal element is really taking over in Flogsta.